Jason Vieaux shares his teaching and performance experience in hundreds of online classical guitar lessons. Students in the guitar course have unlimited access to the video lessons, as well as guitar sheet music and other essentials like the Sor Studies and Carcassi method. What ultimately sets these classical guitar lesson videos apart from other offerings is the ability to submit a video for review using the ArtistWorks Video Exchange Learning® platform. Jason reviews each submission and records a video response, offering specific guidance to take your classical guitar playing to the next level. All students can access the Video Exchange library and watch each other’s interactions with Jason. This library is constantly expanding and may contain the key to unlock your playing. 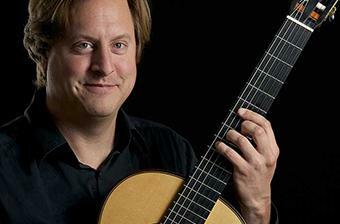 When Jason Vieaux won the Guitar Foundation of America’s International Competition he became one of the youngest stars of the classical guitar world. Jason has been an Artistic Ambassador of the US to Southeast Asia, a Naumburg Foundation Competition top prizewinner, a Cleveland Institute of Music Alumni Achievement Award recipient, a Salon di Virtuosi Career Grant winner, and a former NPR Young-Artist-in-Residence. As a recording artist Jason has 13 albums to his name, including Play which won a Grammy® for Best Classical Instrumental Solo in 2015. Jason, since 2012, has brought his love of classical music and teaching to ArtistWorks. Giuliani - Opus 50 #1 -NEW! Giuliani - Opus 50 #3 -NEW! Giuliani - Opus 51 #1 -NEW! Giuliani - Opus 100 #2 -NEW! Sor - Opus 60 #12 -NEW! Tárrega: Right Hand Exercises - Introduction -NEW! Tárrega: Right Hand Exercises No.1 & 2 -NEW! Tárrega: Right Hand Exercises No.3, 4, 5 & 6 -NEW! Tárrega: Right Hand Exercises No.7 & 8 -NEW! Tárrega: Right Hand Exercises No.17 & 18 -NEW! Carulli: Andantino - G Major -NEW! Carulli: Andante - Opus 241 #18 -NEW! Carulli: Andante - Opus 241 #4 -NEW! Carulli: Waltz in E Minor -NEW! Carcassi: Opus 60 #1 -NEW! Carcassi: Opus 60 #7 -NEW! Carcassi: Opus 60 #8 -NEW! Carcassi: Opus 60 #11 -NEW! Carcassi: Opus 60 #13 -NEW! Carcassi: Opus 60 #14 -NEW! Carcassi: Opus 60 #17 -NEW! Carcassi: Opus 60 #16 -NEW! Giuliani: Opus 1 #1 -NEW! Giuliani: Opus 1 #3 -NEW! Giuliani: Opus 1 #6 -NEW! Giuliani: Opus 50 #5 -NEW! Giuliani: Opus 50 #7 -NEW! Giuliani: Opus 139 #1 -NEW! Giuliani: Opus 139 #3 -NEW! Giuliani: Opus 139 #5 -NEW! Sor: Progressive Study - Opus 6 No.1 -NEW! Sor: Progressive Study - Opus 6 No.2 -NEW! Sor: Progressive Study - Opus 31 No.2 -NEW! Sor: Progressive Study - Opus 31 No.4 -NEW! Sor: Progressive Study - Opus 31 No.5 -NEW! Sor: Progressive Study - Opus 31 No.7 -NEW! Sor: Progressive Study - Opus 31 No.11 -NEW! Sor: Progressive Study - Opus 31 No.14 -NEW! Sor: Progressive Study - Opus 31 No.17 -NEW! Sor: Progressive Study - Opus 31 No.20 -NEW! Sor: Progressive Study - Opus 31 No.23 -NEW! Sor: Progressive Study - Opus 35 No.3 -NEW! Sor: Progressive Study - Opus 35 No.4 -NEW! Sor: Progressive Study - Opus 35 No.8 -NEW! Sor: Progressive Study - Opus 35 No.9 -NEW! Sor: Progressive Study - Opus 35 No.10 -NEW! Sor: Progressive Study - Opus 35 No.13 -NEW! Sor: Progressive Study - Opus 35 No.14 -NEW! Sor: Progressive Study - Opus 35 No.15 -NEW! Sor: Progressive Study - Opus 35 No.18 -NEW! Sor: Progressive Study 1 - Opus 60 No.4 -NEW! Sor: Progressive Study - Opus 60 No.4 -NEW! Sor: Progressive Study - Opus 60 No.16 -NEW! Sor: Progressive Study - Opus 60 No.20 -NEW! Carcassi: Opus 60 #10 -NEW! Tárrega -- "Recuerdos de la Alhambra"
Albéniz: "Rumores de la Caleta"
The best classical guitar course on line bar none! I am a student of the classical guitar course led by Jason Vieaux and I can confirm that this is probably the best course of this kind that you will find on the internet. The repertoire is comprehensive and is split into 3 levels (basic; intermediate; advanced and includes reference topics), and throughout the guidance is thorough, informative and inspiring! The wonderful music of the likes of Carcassi, Guiliani, Sor and Carulli to name but a few are covered with n great detail by a master musician, and there is an in-depth assessment facility in the form of video submissions. I couldn’t recommend this course enough! Mr. Jason Vieaux works way too hard and I am seriously concerned about his health. He has changed my life by being the exellent teacher that he is. I told him this at his recent Dallas concert. I can' t see him going on at the pace he sets for himself. Astonishing! The materials given are enough certainly at the novice level to study for years even just having him as an occasional guide, giving one ample time to study and perfect. One need not to stress about performing...as this is optional. So just having him give guidance is great. I am a very busy surgeon so my hrs are erratic plus I live in a rural area with none to teach me. I'm so happy to find y'all. Thanks! I have been enrolled with the Jason Vieux Guitar School for some time already. I have been learning through his exchanges with other students and of course by working with the materials. As of yet I have not had a direct exchange but still highly recommend the school.